Together with researchers around the world, we aspire to generate groundbreaking ideas, techniques, and tools that enable us to gain the greatest benefit of the data revolution for the good of society. Presentations and demonstrations are key to the summit experience. In a world with a billion sensors, how will we make sense of it all? Rakesh Agrawal is a Microsoft Technical Fellow, heading the Search Labs in Microsoft Research, Silicon Valley. Rakesh is a member of the National Academy of Engineering, and a Fellow of both ACM and IEEE. He has received the ACM-SIGKDD First Innovation Award, ACM-SIGMOD Edgar F. Codd Innovations Award, ACM-SIGMOD Test of Time Award, VLDB 10-Yr Most Influential Paper Award, Computerworld First Horizon Award, NITIE Golden Jubilee Distinguished Alumni Award, and IIT-Roorkee Distinguished Alumni Award. Scientific American named him one of the 50 top scientists and technologists in 2003. Rakesh has been granted more than 70 patents and has published more than 175 research papers, many of them considered seminal. He has written the first and second highest cited papers in the fields of databases and data mining. Rakesh is well known for developing fundamental data mining concepts and technologies and pioneering key concepts in data privacy, including Hippocratic Database, Sovereign Information Sharing, and Privacy-Preserving Data Mining. Before joining Microsoft in March 2006, Rakesh worked as an IBM Fellow at the IBM Almaden Research Center, and earlier, at the Bell Laboratories, Murray Hill. He also worked at the Bharat Heavy Electricals Ltd. in India. He received the M.S. and Ph.D. degrees in Computer Science from the University of Wisconsin-Madison, a B.E. degree in Electronics and Communication Engineering from IIT-Roorkee, and a two-year Post Graduate Diploma in Industrial Engineering from the National Institute of Industrial Engineering, Bombay. P. Anandan has been the managing director of Microsoft Research India since its inception in 2005. Since June 1997, before being named managing director of Microsoft Research India, Anandan was a senior researcher at Microsoft Research headquarters in Redmond, Washington, where he built one of the world’s strongest research teams in computer vision and video processing. During that time, he also served as an ambassador for the Microsoft Research University Relations program in India and helped develop strong relationships between Indian universities and Microsoft Research. He has represented Microsoft in meetings with the government of India to emphasize the company’s commitment to research and development. He was part of the working group constituted by the 12th Planning Commission to make recommendations on India’s Higher Education Policy. Anandan continues Microsoft Research’s ongoing relationships with the government and academic communities in his new role. Before joining Microsoft, Anandan was an assistant professor of computer science for four years at Yale University. Following this, he was a research manager at Sarnoff Corp, Princeton, NJ. He holds a Ph.D. in computer science from the University of Massachusetts, Amherst, which presented him with a Distinguished Alumni award in 2006. He also attended the University of Nebraska, Lincoln, where he received his master of science in computer science, and the Indian Institute of Technology Madras, where he earned his undergraduate degree in electrical engineering. He received the Distinguished Alumni award from IIT Madras in 2010, and was inducted into the “Hall of Computing” by the University of Nebraska in 2010. Anandan is currently on the Board of Governors of IIT Madras. Grey Ballard is currently a Truman Fellow at Sandia National Labs in Livermore, CA. He received his PhD in 2013 from the Computer Science Division (EECS Department) at the University of California Berkeley. He worked in the BeBOP group and Parallel Computing Laboratory under advisor James Demmel. Before coming to Berkeley, he received his BS in math and computer science at Wake Forest University in 2006 and his MA in math at Wake Forest in 2008. His research interests include numerical linear algebra, high performance computing, and computational science, particularly in developing algorithmic ideas that translate to improved implementations and more efficient software. His work has been recognized with the SIAM Linear Algebra Prize and two conference best paper awards, at SPAA and IPDPS, and he received the C.V. Ramamoorthy Distinguished Research Award at the University of California, Berkeley, for his doctorate work. Nilanjan Banerjee is an Assistant Professor at University of Maryland, Baltimore County. He is a 2011 NSF Career Awardee and a 2013 Microsoft Research Software Engineering Innovations Awardee. He received the Yahoo! outstanding dissertation award and the best undergraduate thesis award at IIT Kharagpur. His research interests lie in the intersection of sensor hardware design and embedded software system design. He has received best paper nominations at BuildSys 2012 and Pervasive 2010 and a best paper award at ACM Homenets 2011. Sumit Basu is a Senior Researcher in the Machine Learning Department at Microsoft Research, Redmond. His work involves developing interactive, machine-learning based power tools to assist users in understanding and extracting insights from complex data. His current focus is on using such technologies to help human learners, teachers, and tutors at all levels with their educational goals. This is a deep and complex area, involving problems in document analysis, question generation, automatic grading, models of human memory, models of human understanding and skill level, and much more. In the past, he has worked on interactive scientific computing environments for rapid prototyping of data analysis and algorithms, intelligent tools for music authoring and manipulation, and methods for diagnosing faults in machines and datacenters, as well as a host of other topics. Sumit received his BS (1995), MEng (1997), and PhD (2002) all from MIT in Electrical Engineering and Computer Science; his graduate work was at the MIT Media Lab. He then joined Microsoft Research, initially as a post-doctoral researcher, in 2002. Andrew Begel is a Senior Researcher in the VIBE group at Microsoft Research in Redmond, Washington, United States. He received a Bachelor of Science from MIT in 1996, and a Master of Engineering degree, also from MIT, in 1997. In 2005, he earned a Ph.D. in Computer Science from the University of California, Berkeley. Andrew studies software engineers to understand how communication, collaboration, and coordination behaviors influence their effectiveness in collocated and distributed development. He then builds software tools that incentivize problem-mitigating behaviors. Andrew’s recent work focuses on two topics: the intersection of social computing and software engineering, and the use of biometrics to better understand how software developers do their work. Jeffrey P. Bigham is an Associate Professor in the School of Computer Science at Carnegie Mellon University. He uses clever combinations of on-demand crowds and computation to build and deploy truly intelligent interactive systems, often with a focus on systems supporting people with disabilities. Misha Bilenko leads the Machine Learning Algorithms team in Microsoft’s Cloud+Enterprise division. Before that, he was in the Machine Learning Group in Microsoft Research Redmond for seven years, where he collaborated with a number of product groups on applied machine-learning algorithms, systems, and tools. He joined Microsoft in 2006 after receiving his Ph.D. in Computer Science from the University of Texas at Austin. Papers he co-authored received prizes from KDD and SIGIR; he also co-edited “Scaling up Machine Learning,” published by Cambridge Univ. Press in 2011. Jeff A. Bilmes is a professor at the Department of Electrical Engineering at the University of Washington, Seattle and an adjunct professor in Computer Science & Engineering and the department of Linguistics. He received his Ph.D. in computer science from the University of California in Berkeley. He is a 2001 NSF Career award winner, a 2002 CRA Digital Government Fellow, a 2008 NAE Gilbreth Lectureship award recipient, and a 2012/2013 ISCA Distinguished Lecturer. His primary interests lie in signal processing for pattern classification, speech recognition, language processing, bioinformatics, machine learning, graphical models, submodularity in combinatorial optimization and machine learning, active and semi-supervised learning, computer vision, and audio/music processing. Beginning work in this area in 2003, Prof. Bilmes is one of the first to utilize submodularity in machine learning problems. Judith Bishop is director of Computer Science at Microsoft Research. Her role is to create strong links between Microsoft’s research groups and universities globally, through encouraging projects, supporting conferences, and engaging directly in research. Her expertise is in programming languages and distributed systems, with a strong practical bias and an interest in compilers and design patterns. She initiated the Software Engineering Innovation Foundation (SEIF), which encourages and supports academics worldwide to engage with Microsoft Research. Her current projects are TouchDevelop and Code Hunt, and she worked previously on TryF#. She received her PhD from the University of Southampton and was a professor in South Africa for many years, with visiting positions in the United Kingdom, Germany, Canada, Italy, and the United States. She was general co-chair of ICSE 2010, PC co-chair of TOOLS 2011, and Co-chair of several of Microsoft Research’s Summits and serves frequently on editorial, program, and award committees. She has written 16 books, which have been translated into six languages. Her awards include the IFIP Silver Core and Outstanding Service Award (2006) and the South African Department of Trade and Industry Distinguished Woman of the Year (2005). Jennifer Breslin is the Knowledge, Innovation and Technology for Development Coordinator at UN Women and has worked in the UN System on ICT for Development for over 15 years on related strategy and policy issues, integration of ICT into development programming, the establishment of an innovation incubator, and knowledge networking, sharing and learning. Her thematic focus areas have covered governance and women’s empowerment. In addition, she has been a Girl Scout leader and co-leader for four years with a focus on STE(A)M related activities. Jennifer received her master’s degree from the Fletcher School of Law and Diplomacy where she studied global Internet policy and development economics and her bachelor’s degree from UC Berkeley. Doug Burger is a Director in the Microsoft Research Technologies division. His interdisciplinary group focuses on building prototype systems, currently in the areas of datacenter architecture, silicon acceleration, new user experiences, user privacy, new device designs, and personalized services. Before joining Microsoft in 2008, he was a professor of Computer Science at the University of Texas at Austin. At Texas, he co-led the TRIPS project with Steve Keckler, which produced EDGE architectures, scalable core fusion, and NUCA caches. He is an ACM Fellow, an IEEE Fellow, an ex-athlete, and an avid father. Jonathan Carlson, Ph.D., joined the eScience group at Microsoft as a researcher in 2008, where he studies viral evolution, immunology and vaccine design through statistical modeling. His models of viral escape have achieved broad recognition in the HIV community, where they have led to the discovery of novel viral-host interactions, insights into mechanisms of natural immune control, and the identification of vaccine candidates that are slated for clinical trials. He has authored over 50 papers in the field, including publications in Science and Nature, and has served on advisory panels and committees for the Institutes of Medicine, the Gates Foundation and the Center for HIV/AIDS Vaccine Immunology. Carlson received his BA in 2003 from Dartmouth, where he was awarded the top senior thesis prizes in both biology and computer science, and his Ph.D. in computer science in 2009 from the University of Washington, where he was awarded the university’s distinguished dissertation award and was a finalist for the US Council of Graduate School’s dissertation award. Rich Caruana is a Senior Researcher at Microsoft Research. Before joining Microsoft, Rich was on the faculty at the Computer Science Department at Cornell University, at UCLA’s Medical School, and at CMU’s Center for Learning and Discovery (CALD). Rich’s Ph.D. is from Carnegie Mellon University, where he worked with Tom Mitchell and Herb Simon. His thesis on Multi-Task Learning helped generate interest in a new subfield of machine learning called Transfer Learning. Rich received an NSF CAREER Award in 2004 (for Meta Clustering), best paper awards in 2005 (with Alex Niculescu-Mizil), 2007 (with Daria Sorokina), and 2014 (with Todd Kulesza, Saleema Amershi, Danyel Fisher, and Denis Charles), co-chaired KDD in 2007 (with Xindong Wu), and serves as area chair for NIPS, ICML, and KDD. His current research focus is on learning for medical decision making, deep learning, adaptive clustering, and computational ecology. Adrian Caulfield joined Microsoft Research in July 2013, focusing on using reconfigurable computing to accelerate datacenter-scale workloads. He holds a B.A. in Computer Science from the University of Washington, Seattle, an M.S. in Computer Science, and a Ph.D. in Computer Engineering from the University of California, San Diego (UCSD). His dissertation focused on the development and optimization of Solid State Disks targeting emerging memory technologies such as Phase Change Memory (PCM or PCRAM) and Spin-Torque Transfer MRAMs. He also worked extensively with Flash memory during his time at UCSD. Eric S. Chung is a Researcher in the Microsoft Research Technologies lab in Redmond. Eric is interested in prototyping and productively harnessing novel hardware systems that incorporate specialized hardware such as FPGAs. Eric received his PhD in 2011 from Carnegie Mellon University and was the recipient of the Microsoft Research Fellowship in 2009. His paper on CoRAM, a memory abstraction and architecture for programming FPGAs more effectively, received the best paper award in FPGA 2011. Kelly Cox, co-founder of Iron Way Entertainment, produces digital stories that reach millions of viewers worldwide. Recently, she created Original Fare—a food/travel web series on PBS Food. She has directed and produced projects for Disney, National Academy of Engineering, Cisco, Participant Media, QVC, PBS Parents, and US Open. Mary’s research focuses primarily on emotion tracking, information worker task management, multitasking, and awareness systems for individuals and groups. Her background is in emotion tracking and awareness, visual attention and multitasking. She holds a Ph.D. in Cognitive Psychology from Indiana University in Bloomington. Mary was awarded the ACM SIGCHI Lifetime Service Award, was inducted into the CHI Academy, and became an ACM Distinguished Scientist in 2010. She received the Distinguished Alumni award from Indiana University’s Brain and Psychological Sciences department. Here is a link to her curriculum vita. Here is a link to a recent article on her research in the Washington Post. Here is a video from Channel 9 and a Forbes article about our work. Li Deng received the Ph.D. from the University of Wisconsin-Madison. He was an assistant professor (1989–1992), associate professor (1992–1996), and Full Professor (1996–1999) at the University of Waterloo, Ontario, Canada. In 1999, he joined Microsoft Research, Redmond, WA, where he is currently a Principal Researcher and Research Manager in the Deep Learning Technology Center of MSR-T. In the general areas of audio/speech/language technology and science, machine learning, signal/information processing, and computer science, he has published more than 300 refereed papers in leading journals and conferences, and authored or co-authored four books, including the latest book, Deep Learning: Methods and Applications. He is a Fellow of the Acoustical Society of America, a Fellow of the IEEE, and a Fellow of the International Speech Communication Association. He currently serves as Editor-in-Chief for the IEEE Transactions on Audio, Speech and Language Processing. His technical work since 2009 on industry-scale deep learning with colleagues and academic collaborators have created high impact (e.g., recognized by the 2013 IEEE SPS Best Paper Award and Microsoft Research Technology Transfer Awards) in speech recognition by the DNN work and in other areas of information technology including text analysis and information retrieval by the DSSM work. Hadi Esmaeilzadeh is the Catherine M. and James E. Allchin Early Career Professor of Computer Science at Georgia Institute of Technology. His dissertation received the 2013 William Chan Memorial Dissertation Award from University of Washington. He founded the Alternative Computing Technologies (ACT) Lab, where he works with his students on developing new technologies and cross-stack solutions to develop the next generation computing systems for emerging applications. Hadi received his Ph.D. in Computer Science and Engineering from University of Washington in 2013. He has a master’s degree in Computer Science from The University of Texas at Austin (2010), and a master’s degree in Electrical and Computer Engineering from University of Tehran (2005). Hadi received the Google Research Faculty Award in 2013. Hadi’s research is recognized by three Communications of the ACM Research Highlights and three IEEE Micro Top Picks. His work on dark silicon has been profiled in the New York Times. Shelly Farnham is a Social Computing researcher specializing in online community, social networks, identity, mobile social, and most recently civic media. Shelly earned a Ph.D. in Social Psychology in 1999, and through her drive to have a real world impact on people’s lives, has since worked as an innovation researcher at both world class organizations such as Yahoo! (2009) and Microsoft Research (1999–2005, and presently), and as a startup consultant and founder (2006–2008). She brings her expertise in social technology theory, research, and best practices to the design, development, and evaluation of early stage new technologies in the social space—including social networking, community, and mobile social technologies. Shelly’s unique approach integrating social science, development skills, and artistic creativity has led to numerous award winning papers, patents, and startup companies, and frequent appearances in news media. See her online profile for work history, publications, patents, and statement of research interests and contributions. Michael J. Freedman is an Associate Professor in the Computer Science Department at Princeton University. His research broadly focuses on distributed systems, networking, and security, and has led to commercial products and deployed systems reaching millions of users daily. Honors include a Presidential Early Career Award (PECASE), Sloan Fellowship, NSF CAREER Award, ONR Young Investigator Award, DARPA CSSG membership, and multiple award publications. Dr. Dennis Gannon is a director in the Cloud Research Engagements team at Microsoft Research. As part of that effort, he has provided cloud resource research projects in 13 countries in collaboration with the US National Science Foundation; the European Commission; the Japanese National Informatics Institute; the national laboratories CSIRO, NICTA, and ANU in Australia; the Taiwan National Science Council; and the National Academy of Science in China. Prior to coming to Microsoft, Dr. Gannon was a professor and chair of Computer Science at Indiana University and the Science Director for the Indiana Pervasive Technology Labs. Dr. Gannon’s research interests include cloud computing, large-scale cyberinfrastructure, distributed computing, computer networks, parallel programming and computational science. He led several software projects for Defense Advanced Research Projects Agency (DARPA) and the Department of Energy related to programming massively parallel systems. He has worked extensively with NSF on interdisciplinary science projects. Jianfeng Gao is Principal Researcher in Natural Language Processing Group at Microsoft Research. Recently, he joined Deep Learning Technology Center (DLTC) at Microsoft Research, working on Deep Learning for Text Processing. From 2005 to 2006, he was a software developer in Natural Interactive Services Division at Microsoft. From 1999 to 2005, he was a researcher in Natural Language Computing Group at Microsoft Research Asia. 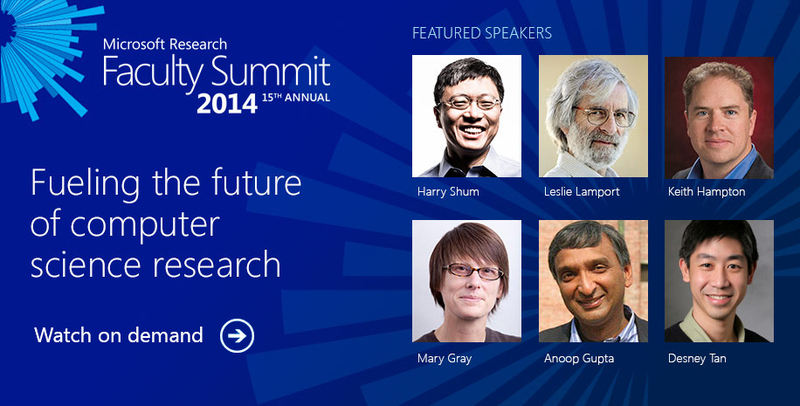 Mary L. Gray is a senior researcher at Microsoft Research New England. She studied anthropology before receiving her Ph.D. in Communication from the University of California, San Diego in 2004. Her research looks at how media access and everyday uses of technologies shape people’s lives. Her most recent book, Out in the Country: Youth, Media, and Queer Visibility in Rural America (New York University Press, 2009), which won awards from scholarly societies in anthropology, media studies, and sociology, examines how lesbian, gay, bisexual, and transgender young people negotiate and express their identities in rural parts of the United States—and the role that media, particularly the Internet, play in their lives and political work. She served on the executive board of the American Anthropological Association from 2008 until 2010 and holds a seat on that group’s Committee on Public Policy. She maintains an appointment as an associate professor of Communication and Culture, with adjunct appointments in American Studies, Anthropology, and Gender Studies at Indiana University. Anoop Gupta is a Distinguished Scientist at Microsoft Research, focusing on cross-disciplinary projects that have potential for large business or societal impact. He is currently focusing on future of rich-media documents, collaboration, and technology as a tool for transformation in education. From 2007 to 2009, Gupta served as corporate vice president of technology policy and strategy. From 2003 to 2007, Gupta was the founding CVP for Microsoft’s Unified Communications business (now Lync). From 2001 to 2003, Gupta was technology assistant to Bill Gates. Gupta joined Microsoft in 1997 after Microsoft acquired his startup VXtreme. Before joining Microsoft in 1997, Gupta was a professor of Computer Science at Stanford. He has published more than 100 papers in major conferences and journals and has issued more than 65 US patents. Gupta received his Ph.D. from CMU in computer science in 1986. He holds a B.Tech. in EE from IIT Delhi, where he graduated receiving the President’s Gold Medal in 1980. Isabelle Guyon is an independent consultant, specialized in statistical data analysis, pattern recognition, and machine learning. Her areas of expertise include computer vision and bioinformatics. Her recent interest is in applications of machine learning to the discovery of causal relationships. Prior to starting her consulting practice in 1996, Isabelle Guyon was a researcher at AT&T Bell Laboratories, where she pioneered applications of neural networks to pen computer interfaces and co-invented Support Vector Machines (SVM), a machine learning technique, which has become a textbook method. She is also the primary inventor of SVM-RFE, a variable selection technique based on SVM. The SVM-RFE paper has thousands of citations and is often used as a reference method against which new feature selection methods are benchmarked. She also authored a seminal paper on feature selection that received thousands of citations. She organized many challenges in Machine Learning over the past few years supported by the EU network Pascal2, NSF, and DARPA, with prizes sponsored by Microsoft, Google, and Texas Instruments. Isabelle Guyon holds a Ph.D. degree in Physical Sciences from the University Pierre and Marie Curie, Paris, France. She is president of Chalearn, a non-profit dedicated to organizing challenges; vice-president of the Unipen foundation; adjunct professor at New-York University; action editor of the Journal of Machine Learning Research; and editor of the Challenges in Machine Learning book series of Microtome. Keith N. Hampton is an Associate Professor in the Department of Communication, School of Communication and Information, at Rutgers University. He received his Ph.D. and M.A. from the University of Toronto in sociology, and a B.A. in sociology from the University of Calgary. Before joining the faculty at Rutgers, he was a member of the faculty in the Annenberg School for Communication, University of Pennsylvania, and a faculty member in the Department of Urban Studies and Planning at the Massachusetts Institute of Technology. He regularly offers courses in social network analysis, mediated communication, and research methods. His research interests focus on the relationship between new information and communication technologies, social networks, and the urban environment. Through a broad range of empirical approaches, that has included ethnographies of urban neighborhoods, observations of public spaces, and large-scale national surveys, he has been studying the social consequences of the Internet since the late 1990s. Most recently, he has looked at how stress, social capital, social isolation, helping behavior, political participation, and democratic deliberation have changed as a result of the use of new digital technologies. Chris Harrison is an Assistant Professor of Human-Computer Interaction at Carnegie Mellon University. He broadly investigates novel sensing technologies and interaction techniques, especially those that empower people to interact with small devices in big ways. Harrison was named as one of the top 30 scientists under 30 by Forbes, a top 35 innovator under 35 by MIT Technology Review, and one of six innovators to watch in 2013 by Smithsonian. When not in the lab, Chris can be found welding sculptures, renovating his house, and visiting remote corners of the globe. Xiaodong He is a Researcher of Microsoft Research, Redmond. He is also an Affiliate Professor in Electrical Engineering at the University of Washington, Seattle. His research interests include deep learning, spoken language understanding, machine translation, natural language processing, information retrieval, and machine learning. Dr. He has published a book and more than 60 technical papers in these areas, and has given a tutorial on speech translation at ICASSP2013. In benchmark evaluations, he and his colleagues have developed entries that obtained No. 1 place in the 2008 NIST Machine Translation Evaluation (NIST MT) and the 2011 International Workshop on Spoken Language Translation Evaluation (IWSLT), both in Chinese-English translation, respectively. He served as Associate Editor/Guest Editor of several IEEE Journals and in the organizing committee of ICASSP2013. He is a senior member of IEEE and a member of ACL. Eric Horvitz is Managing Director at Microsoft Research, Redmond. He has pursued research on machine learning and statistics, decision analysis, and machine intelligence. His research spans theory and practice, and has led to the fielding of applications and services in healthcare, information retrieval, human-computer interaction, and e-commerce. He has pursued studies in human computation, focusing on task routing and problem solving that leverages the complementary skills of human and machine intellect. Eric received his PhD and MD degrees at Stanford University. He has been elected Fellow of the National Academy of Engineering (NAE), the Association for the Advancement of Artificial Intelligence (AAAI), the American Academy of Arts and Sciences, and the American Association for the Advancement of Science (AAAS). He has served as president of AAAI, chair of the AAAS Section on Information, Computing, and Communication, on DARPA ISAT, CCC, and the NSF CISE advisory board. Dr. Leroy Hood has made many seminal discoveries in the fields of immunology, neurobiology, and biotechnology and is a leader in the development of systems biology, its applications to cancer, neurodegenerative disease, and the linkage of systems biology to personalized medicine. Hood is now pioneering new approaches to P4 medicine—predictive, preventive, personalized and participatory, and most recently, has embarked on creating a P4 pilot project on 100,000 well individuals, that is transforming healthcare. Harold Javid’s career spans industry and academia. After completing a PhD in EE from UIUC, Harold worked for small companies as electronics division manager and general manager developing real time embedded controls and industrial optimizers. In between, he worked in large companies including GE and Boeing as application engineer, researcher, and research manager. In 1998, after turning around a small company and then supporting its sale, he followed his heart back to his technical love—by joining Microsoft. In Microsoft Research, as director of academic outreach, he leads collaborations between Microsoft Research and universities in North America, Latin America, and Australia. Harold’s team is responsible for events such as the Microsoft Research Faculty Summit and the annual Microsoft eScience Workshop, awards programs such as the Microsoft Research Faculty Fellowship program in addition to funded university collaborations. Harold is actively involved in service to the IEEE as a member of the Industry Advisory Board for the Computer Society and assistant treasurer of its Board of Governors. Rane Johnson engages with academics worldwide to identify high-impact areas for research investigations. She is working on projects that use technology to transform how we learn about history and how we eradicate human trafficking. Johnson also serves as Microsoft Research’s lead for growing, attracting, and retaining women in research, science, and engineering. She works with NCWIT, Anita Borg, CRA-W, and researchers to grow the pipeline of women in research and STEM fields. She is passionate about education and technology, with 16 years of experience in the field. Johnson is a graduate of Bucknell University with a B.S. in Mechanical Engineering and a B.A. in Economics/Finance, and of George Fox University with an Executive MBA in Transformational Leadership. Aman Kansal is a senior researcher at Microsoft Research, in the Sensing and Energy Research Group. He received his PhD in Electrical Engineering from University of California Los Angeles, where he was honored with the department’s Outstanding PhD Award. His current research interests include computational resource efficiency in data centers and sensing systems. His research prototypes in these areas have been recognized through international design contest awards and are actively used worldwide, with one of his recent prototype tools for energy efficiency exceeding three-hundred-thousand downloads. He has published over 65 research papers at premier computer science conferences and journals, and shipped his research through Microsoft products including Windows Phone, Bing Mobile, and Visual Studio. His work has also been recognized with the Microsoft Gold Star award, given for exceptional contributions towards Microsoft’s success. Dr. Kansal has served on the NSF Committee of Visitors to review the NSF research funding process in Computer and Network Systems, co-chaired the PhoneSense and ImageSense workshops at ACM Sensys, and served on numerous TPCs and organization committees. Dr. Lamport received a doctorate in mathematics from Brandeis University, with a dissertation on singularities in analytic partial differential equations. This, together with a complete lack of education in computer science, prepared him for a career as a computer scientist at Massachusetts Computer Associates, SRI, Digital, and Compaq. He claims that it is through no fault of his that of those four corporations, only the one that was supposed to be non-profit still exists. He joined Microsoft in 2001, but that company has not yet succumbed. Dr. Lamport’s initial research in concurrent algorithms made him well known as the author of LaTeX, a document formatting system for the ever-diminishing class of people who write formulas instead of drawing pictures. He is also known for writing, “A distributed system is one in which the failure of a computer you didn’t even know existed can render your own computer unusable,” which established him as an expert on distributed systems. His interest in Mediterranean history, including research on Byzantine generals and the mythical Greek island of Paxos, led to his receiving five honorary doctorates from European universities, and to the IEEE sending him to Italy to receive its 2004 Piore Award and to Quebec to receive its 2008 von Neumann medal. However, he has always returned to his home in California. This display of patriotism was rewarded with membership in the National Academy of Engineering and the National Academy of Sciences. More recently, Dr. Lamport has been annoying computer scientists and engineers by urging them to understand an algorithm or system before implementing it, and scaring them by saying they should use mathematics. In an attempt to get him to talk about other things, the ACM gave him the 2013 Turing Award. Matthew Lease is an Assistant Professor in the School of Information at the University of Texas at Austin, studying information retrieval, human computation, and crowdsourcing. Lease is the recipient of multiple early career awards (NSF, IMLS, and DARPA), and his research has been featured in WIRED magazine’s “Danger Room”. He also received the Modeling Challenge Award at the 2012 International Conference on Social Computing, Behavioral-Cultural Modeling, & Prediction (SBP), and was recently selected for the 2014 Heidelberg Laureate Forum. Lease presented an invited keynote at the International Joint Conference on Natural Language Processing in 2011, as well as crowdsourcing tutorials at ACM SIGIR, ACM WSDM, CrowdConf, and SIAM Data Mining. From 2011 to 2013, he co-organized the Crowdsourcing Track for the National Institute of Standards and Technology Text REtrieval Conference. Lease has also spent a sabbatical at CrowdFlower studying crowdsourcing challenge problems at industry-scale. Professor Hyunju Lee is currently an associate professor at Gwangju Institute of Science and Technology (GIST). She received a B.S. degree from Korea Advanced Institute of Science and Technology (KAIST), Daejon, Korea, in 1997; an M.S. degree from Seoul National University, Seoul, Korea, in 1999; and a Ph.D. degree from the University of Southern California, United States, in 2006. She served as a Full-Time Lecturer at the School of Information and Communications of GIST from 2007 to 2008 and as an Assistant Professor from 2008 to 2013. She has been an Associate Professor since 2013. Prior to joining GIST, she was a post-doctoral researcher at the Harvard Medical School from 2006 to 2007. Her research interests include data mining, bioinformatics, cancer genetics, and text mining, and she has published highly-cited papers in international journals. She has been developing novel data mining methods for diverse area from the Internet to life science. Currently, she is building a search engine for cancer researchers and integrative algorithms for revealing new biomarkers for various diseases. Dr. Peter Lee is Corporate Vice President and Head of Microsoft Research. He manages Microsoft’s worldwide research operations, comprising 13 laboratories and more than 1,100 researchers, engineers, and support personnel dedicated to advancing the state of the art in computing and creating new technologies for Microsoft’s products and services. Prior to joining Microsoft, Lee held key positions in both government and academia, most recently at the Defense Advanced Research Projects Agency (DARPA), where he founded and directed a major technology office that supported research in computing and related areas in the social and physical sciences. Prior to DARPA, Lee served as head of Carnegie Mellon University’s nationally top-ranked computer science department. He also served as the university’s vice-provost for research. Lee has shown executive-level leadership in world-class research organizations spanning academia, government, and industry. He is a Fellow of the Association for Computing Machinery and serves the research community at the national level, including policy contributions to the President’s Council of Advisors on Science and Technology and membership on both the National Research Council’s Computer Science and Telecommunications Board and the Advisory Council of the Computer and Information Science and Engineering Directorate of the National Science Foundation. He was the former chair of the Computing Research Association and has testified before both the US House Science and Technology Committee and the US Senate Commerce Committee. Andrew Lenharth is Research Associate and Computer Science Lecturer at the University of Texas at Austin. He was the primary author of the current implementation of the Galois System, which provides a simple, serial programming model absent user-visible synchronization for writing parallel applications. He works on scaling to NUMA and distributed systems. Andrew is working on projects in hardware-software co-design, performance and scaling prediction, GPU runtimes, and approximate computing. Andrew earned his Ph.D. at the University of Illinois at Urbana-Champaign, working with Vikram Adve. He worked on points-to analysis (DSA), memory safety (SAFECODE), secure operating systems (SVA), and commodity OS fault recovery (his thesis work). His work involved using points-to analysis to drive non-trivial transformations of OS kernels to introduce safety or reliability. While working on his dissertation, he worked on LLVM, a collection of modular and reusable compiler and toolchain technologies. He authored several passes still in existance (for example, reg2mem); rewrote the profiling framework and implemented sampling based profilers; introduced several language features, including packed structures and bit-counting intrinsics; implemented the first 64-bit backend (DEC Alpha) for the current instruction selector; and worked on points-to analysis (DSA). Ben Livshits is a research scientist at Microsoft Research in Redmond, and an affiliate professor at the University of Washington. Originally from St. Petersburg, Russia, he received a bachelor’s degree in Computer Science and Math from Cornell University in 1999, and his M.S. and Ph.D. in Computer Science from Stanford University in 2002 and 2006, respectively. Dr. Livshits’ research interests include application of sophisticated static and dynamic analysis techniques to finding errors in programs. Ben has published papers at PLDI, POPL, Oakland Security, Usenix Security, CCS, SOSP, ICSE, FSE, and many other venues. He is known for his work in software reliability—especially tools to improve software security—with a primary focus on approaches to finding buffer overruns in C programs and a variety of security vulnerabilities (cross-site scripting, SQL injections, etc.) in web-based applications. He is the author of several dozen academic papers and patents. Lately, he has been focusing on how Web 2.0 application and browser reliability, performance, and security can be improved through a combination of static and runtime techniques. Michael Luca is an assistant professor of business administration at Harvard Business School. Professor Luca studies online platforms, focusing on user-generated content and online marketplaces. His current work focuses on crowd-sourced reviews, analyzing a variety of companies including Yelp, Amazon, and Airbnb. His findings have been written and blogged about in a variety of media outlets, including The Wall Street Journal, The New York Times, The Washington Post, The Huffington Post, Chicago Tribune, Harvard Business Review, and Salon. Professor Luca received his Ph.D. in economics from Boston University. Brandon is currently looking at developing new programming and execution models—with hardware and software support—that help make intermittently-powered, systems correct, reliable, and programmable (despite their bad habit of rebooting all the time). Brandon is also doing work to bridge the gap between today’s largely homogenous system designs and the heterogeneous and application-specialized parallel architectures and systems. Brandon’s prior (and ongoing) work aims to make concurrent and parallel systems correct and reliable. Brandon’s work defines new architecture and system support that helps programmers find and fix their bugs, as well as avoiding failures that stem from broken software. Brandon received his PhD in 2013 from the University of Washington. Dr. Parker MacCready is a Professor at the University of Washington School of Oceanography. His research focuses on the physics—and numerical simulation—of ocean circulation and biogeochemistry in coastal and estuarine regions. He recently spent four months as a Visiting Researcher at Microsoft Research Connections, and is working with the group to create a daily forecast model of Washington and Puget Sound waters, with the goal of making Ocean Acidification predictions that will be useful to shellfish growers. Christopher Manning is a Professor of Computer Science and Linguistics at Stanford University. His Ph.D. is from Stanford in 1995, and he held faculty positions at Carnegie Mellon University and the University of Sydney before returning to Stanford. He is a fellow of ACM, AAAI, and the Association for Computational Linguistics. Manning has coauthored leading textbooks on statistical approaches to natural language processing (Manning and Schuetze, 1999) and information retrieval (Manning, Raghavan, and Schuetze, 2008). His recent work has concentrated on probabilistic approaches to natural language processing (NLP) problems and computational semantics, particularly including such topics as statistical parsing, robust textual inference, machine translation, large-scale joint inference for NLP, computational pragmatics, and hierarchical deep learning for NLP. Winter Mason is a Data Scientist at Facebook. He received his Ph.D. from Indiana University in social psychology and cognitive science in 2007 and did a post-doc in the Human and Social Dynamics lab at Yahoo. He currently studies social networks and social media, including crowdsourcing, group dynamics, and social influence. Kathryn S. McKinley is a Principal Researcher at Microsoft. She was previously an Endowed Professor of Computer Science at The University of Texas at Austin and received her PhD, MS, and BA from Rice University. Her research interests span programming language implementation, architecture, security, performance, and energy. She and her collaborators have produced widely used tools: the DaCapo Java Benchmarks, TRIPS Compiler, Hoard memory manager, MMTk garbage collector toolkit, and the Immix garbage collector. Her awards include the 2012 ACM SIGPLAN Programming Languages Software Award, the 2011 ACM SIGPLAN Distinguished Service Award, Best & Most Influential awards (ASPLOS, OOPSLA, ICS, SIGMETRICS), IEEE Top Picks, and CACM Research Highlights. Her service includes program chair for ASPLOS ’04, PACT ’05, PLDI ’07, ISMM’12, and CGO’13; Editor-in-Chief of ACM TOPLAS (2007-2010); DARPA ISAT member (2012-present), CRA Board member (2012-present), and CRA-W co-chair (2011-present). Dr. McKinley was honored to testify to the House Science Committee (Feb. 14, 2013). She has graduated 18 PhD students. She is an IEEE Fellow and an ACM Fellow. Nima Mesgarani is an assistant professor of Electrical Engineering at Columbia University. He received his Ph.D. from University of Maryland where he worked on neuromorphic speech technologies and neurophysiology of auditory cortex. He was a postdoctoral scholar in Center for Language and Speech Processing at Johns Hopkins University, and the neurosurgery department of University of California San Francisco before joining Columbia in fall 2013. Andrés Monroy-Hernández is a researcher in FUSE Labs at Microsoft Research, and an affiliate faculty in the Department of Communication at the University of Washington. His work focuses on the design and study of social computing systems for collaborative creativity and collective action. Andrés has examined the use of social media during war and political uprisings; was the creator of the Scratch Online Community—a website where millions of young people learn to program and remix video games and animations. More recently, he’s been studying the Peer Economy. Andrés was named one of the TR35 Innovators by the MIT Technology Review in Spanish, and one of CNET’s influential Latinos in Tech. His research has received best paper awards at CHI, CSCW, ICWSM, recognized at Ars Electronica, and featured in The New York Times, The Guardian, NPR, and WIRED. He holds a Ph.D. from the MIT Media Lab, and a B.S. from Tec de Monterrey. Madan Musuvathi is a Senior Researcher in the Research in Software Engineering group at Microsoft Research. His research focus is on parallelism and concurrency and is broadly interested in systems, program analysis, model checking, verification, and theorem proving. His research has resulted in productivity tools for software developers and testers at Microsoft and other companies. He received his Ph.D. from Stanford University in 2004. Jeffrey Nickerson is Professor and the Director of the Center for Decision Technologies in the Howe School of Technology Management at Stevens Institute of Technology. His research and teaching interests include crowd work, social media analytics, information systems design, and collective intelligence. He is the principal investigator of an NSF-funded project researching crowd creativity. He has published in ACM Transactions on Computer-Human Interaction and ACM Transactions on Interactive Intelligent Systems, and he is the co-general chair of Collective Intelligence 2014. Mari Ostendorf is the Endowed Professor of System Design Methodologies in the Electrical Engineering Department at the University of Washington. She received her PhD in electrical engineering from Stanford University and worked at BBN Laboratories and Boston University. From 2009 to 2012, she served as the Associate Dean for Research and Graduate Studies in the College of Engineering. Prof. Ostendorf’s research interests are in dynamic statistical models for speech and language processing. Her work has resulted in more than 200 publications and two paper awards. Prof. Ostendorf has served as co-Editor of Computer Speech and Language, the Editor-in-Chief of the IEEE Transactions on Audio, Speech and Language Processing, and the VP Publications for the IEEE Signal Processing Society. She is a Fellow of IEEE and ISCA, a recipient of the IEEE HP Harriett B. Rigas Award, an Australia-America Fulbright Scholar, and an IEEE Signal Processing Society Distinguished Lecturer. Ravi Pandya is in the eScience group at Microsoft Research, where he works on high-performance algorithms for genome alignment, assembly, and structural variation. He is one of the authors of the SNAP short-read aligner, which can produce high-quality genome alignments 3-10x faster than other state-of-the art aligners. He is also involved in the BeatAML collaboration between Microsoft Research, UC Berkeley, and Oregon Health & Science University, to apply machine learning, predictive analytics, and systems biology to recommend personalized, targeted drug combinations for recurrent leukemia patients in an upcoming clinical trial. He has been a software architect at Microsoft for 11 years, previously working on Rights Management Services, Windows Security, operating systems incubation, and the Orleans distributed computing framework powering the Halo 4 web services. Prior to joining Microsoft, he worked at a range of startups, including molecular modeling, hypertext, group collaboration, and software agent technology. Rajesh Patel is a senior program manager at Microsoft with Bing.com. He owns the direction, strategy, and execution of the crowdsourcing platform at Bing. Building software to solve business problems and enabling many users’ scenarios via a platform is his passion and expertise. He has been engaged in understanding crowdsourcing trends and their impact on business. In the Bing Core Relevance group, Patel has delivered Microsoft’s first crowdsourcing platform to enable flexible human annotations for Bing to improve the relevance of search results and relevance measurement. The usage of crowdsourcing on this platform is increasing across Microsoft. Patel is engaged in crowdsourcing research areas and participates in crowdsourcing presentations and panel discussions. Karen Peterson is CEO for the EdLab Group and Principal Investigator for the National Girls Collaborative Project (NGCP). The NGCP maximizes access to shared resources for organizations expanding girls’ participation in STEM by using the leverage of a network to create the tipping point for gender equity in STEM. NGCP serves 39 states, facilitating collaboration between organizations serving 8.3 million girls and 4.7 million boys. Peterson is also Co-PI for the NSF-funded ITEST Learning Resource Center, Citizen SciGirls, SciGirls CONNECT, and Build IT Scale Up projects. These projects address gender, racial and socioeconomic underrepresentation in STEM fields. In 2013, Peterson was profiled in STEMConnector’s 100 Women Leaders in STEM publication. A graduate of the University of Washington, Bothell campus, her master’s thesis focused on gendered attitudes towards computer use in education. Keshav Pingali is a Professor in the Department of Computer Science at the University of Texas at Austin, and he holds the W.A.”Tex” Moncrief Chair of Computing in the Institute for Computational Engineering and Sciences (ICES) at the University of Texas at Austin. He was on the faculty of the Department of Computer Science at Cornell University from 1986 to 2006, where he held the India Chair of Computer Science. Pingali’s research has focused on programming languages and compiler technology for program understanding, restructuring, and optimization. His group is known for its contributions to memory-hierarchy optimization; some of these have been patented. Algorithms and tools developed by his projects are used in many commercial products such as Intel’s IA-64 compiler, SGI’s MIPSPro compiler, and HP’s PA-RISC compiler. His current research is focused on programming language and tools for multicore processors. Pingali is a Fellow of the ACM, IEEE and the American Association for the Advancement of Science. He was the co-Editor-in-chief of the ACM Transactions on Programming Languages and Systems, and currently serves on the editorial boards of the International Journal of Parallel Programming and Distributed Computing. He has also served on the NSF CISE Advisory Committee (2009–2012). Kris is a co-Director of the Berkeley Sensor and Actuator Center (BSAC) and a researcher with the Center for Information Technology Research in the Interest of Society (CITRIS). Professor David Reilly is an experimental physicist working at the interface of quantum science, nanoscale condensed matter systems, and cryogenic electronics and hardware. Professor Reilly completed his Ph.D. at University of New South Wales (UNSW) in 2002 on correlated electron phenomena in low-dimensional nanoelectronic devices. From 2005 to 2008, he was a Postdoctoral Fellow at Harvard University, working on spin qubits. He returned to Australia in 2008 to lead a new research group, the Quantum Nanoscience Laboratory, in the School of Physics at Sydney. He is a member of the Quantum Science Group in the School and a CI in the ARC Centre of Excellence for Engineered Quantum Systems. Reilly is currently the Academic Director of Strategy for the Australian Institute of Nanoscience. Arjmand Samuel works with the academic community to foster research and collaborations in the devices and services research areas. He leads the mobile and cloud computing research and outreach for Microsoft Research (Project Hawaii and TouchDevelop). His recent research interests are in software architectures and programming paradigms for devices of all shapes and forms (TouchDevelop and HomeOS). He has published in a variety of publications on topics of security, privacy, location aware access control, and innovative use of mobile technology. Samuel has a Ph.D. in Information Security from Purdue University. Lucy Sanders is CEO and co-founder of the National Center for Women & Information Technology (NCWIT), a consortium of more than 300 corporations, universities, and nonprofits working to increase the participation of girls and women in computing and information technology. She also serves as executive-in-residence for the ATLAS Institute at the University of Colorado Boulder. Sanders has an extensive industry background, having worked in R&D and executive positions at AT&T Bell Labs, Lucent Bell Labs, and Avaya Labs for more than 20 years, specializing in systems-level software and solutions, multimedia communication, and customer-relationship management. In 1996, she was awarded the Bell Labs Fellow Award, the highest technical accomplishment bestowed at the company. In 2004, she was awarded the Distinguished Alumni Award from the Department of Engineering at the University of Colorado Boulder, and in 2011, she was recognized with the university’s George Norlin Award, for distinguished lifetime service. She has been inducted into the Women in Technology International Hall of Fame and recently was named by the U.S. Secretary of Commerce to serve on the department’s Innovation Advisory Board. Sanders received her B.S. and M.S. in computer science from Louisiana State University and the University of Colorado Boulder, respectively. Dr. Robert Schoelkopf is a Sterling Professor of Applied Physics and Physics, and Associate Director of the Yale Institute for Nanoscience and Quantum Engineering. He received his A.B. in physics from Princeton University in 1986, and then spent two years as an electrical/cryogenic engineer at NASA’s Goddard Space Flight Center, developing low-temperature radiation detectors and cryogenic instrumentation for future space missions. He completed his education at the California Institute of Technology, receiving his Ph.D. in physics in 1995. Since then, he has been at Yale University, first as a postdoctoral associate and lecturer, then joining the faculty as an assistant professor in 1998. His present research interests center around the physics of nanostructures and single-electron devices, as well as their application to problems in metrology, ultrasensitive detectors, and quantum computation. Harry Shum is executive vice president of Microsoft’s Technology and Research group. He is responsible for driving the company’s overall technical directions, including mid-term and long-term technology strategy, technology policy, and forward-looking research and development efforts. He oversees Microsoft Research, one of the world’s premier computer-science research organizations, and its integration with the engineering teams across the company. He also oversees the company’s Trustworthy Computing group and Technology Policy group. Previously, Dr. Shum served as the corporate vice president responsible for Bing search product development from 2007 to 2013. Prior to his engineering leadership role at Bing and online services, he oversaw the research activities at Microsoft Research Asia and the lab’s collaborations with universities in the Asia-Pacific region, and was responsible for the Internet Services Research Center, an applied research organization dedicated to advanced technology investment in search and advertising at Microsoft. Dr. Shum joined Microsoft Research in 1996 as a researcher based in Redmond, Washington. In 1998, he moved to Beijing as one of the founding members of Microsoft Research China (later renamed Microsoft Research Asia). There, he began a nine-year tenure as a researcher, subsequently moving on to become research manager, assistant managing director, managing director of Microsoft Research Asia, and a Distinguished Engineer. Dr. Shum is an IEEE Fellow and an ACM Fellow for his contributions to computer vision and computer graphics. He received his Ph.D. in robotics from the School of Computer Science at Carnegie Mellon University. Paul Smolensky is Krieger-Eisenhower Professor of Cognitive Science at Johns Hopkins University. His research develops methods for performing grammatical computation in neural networks. A member of the PDP Research Group at UCSD (1986), he developed Harmony Theory, proposing what is now known as the “Restricted Boltzmann Machine” architecture. He then developed Tensor Product Representations (1990), a compositional, recursive technique for encoding symbol structures as real-valued activation vectors. Combining these two theories, he developed Harmonic Grammar (1990, with G. Legendre & Y. Miyata) and then Optimality Theory (1993, with A. Prince), a grammatical formalism now widely used in phonological theory. He received the 2005 David E. Rumelhart Prize for Outstanding Contributions to the Formal Analysis of Human Cognition and will hold the Sapir Professorship at the 2015 LSA Linguistic Institute. Erin Solovey is an Assistant Professor of Computer Science at Drexel University and also is affiliated with the Drexel School of Biomedical Engineering, Science and Health Systems. Dr. Solovey’s main research area is human-computer interaction, specifically emerging interaction techniques, such as brain-computer interfaces, physiological and wearable computing, and reality-based interaction. She designs, builds and evaluates systems to support users dealing with variable workload levels and multitasking, and systems that provide novel learning experiences. She also investigates effective human interaction with complex and autonomous systems and vehicles. Her work has received awards including the NSF/CRA Computing Innovation Fellowship and three CHI Best Paper Award Honorable Mentions. She received a bachelor’s degree in computer science from Harvard, and her Masters and Ph.D. in computer science from Tufts. She was a research intern at Microsoft Research in 2008. After her graduate studies, she was a postdoctoral fellow in the MIT Humans and Automation Lab. Arun Sundararajan is Professor and NEC Faculty Fellow at New York University’s Leonard N. Stern School of Business. He also heads the Social Cities Initiative at NYU’s Center for Urban Science+Progress, and is an affiliated faculty member at NYU’s Center for Data Science. Professor Sundararajan’s research program studies how digital technologies transform business and society. Current topics include the governance of digital spaces, the collaborative-peer- sharing economy, social media and cities, digital institutions, contagion in networks, and strategy in digital markets. His research has been recognized by four Best Paper awards and recently profiled by trade publications that include The Atlantic, Bloomberg Businessweek, Fast Company, Financial Times, Forbes, and The Wall Street Journal. His op-eds and expert commentary have appeared in TIME Magazine, the New Yorker, the New York Times, Wired, TechCrunch, the Wall Street Journal, the Financial Times and Harvard Business Review, and on BBC News, Bloomberg, CNN, CNBC, Fox, NPR and PBS. He is one of the founders of the Workshop on Information in Networks. He holds degrees from the Indian Institute of Technology, Madras and the University of Rochester. Siddharth “Sid” Suri works at the intersection of computer science and behavioral economics. His work analyzes the relationship between social network topology and behavior using a variety of techniques including behavioral experiments, massive data analysis and theoretical modeling. Moreover, Sid has become one of the leaders in designing, building, and conducting “virtual lab” experiments using Amazon’s Mechanical Turk. His work has appeared in Science, PNAS, as well as top computer science venues. He won the Best Paper award and a Top 10% Paper award in ACM EC 2012. Sid earned his Ph.D. in computer and information science from the University of Pennsylvania in 2007 under the supervision of Michael Kearns. After that, he was a postdoctoral associate working with Jon Kleinberg in the computer science department at Cornell University. Then he moved to the Human & Social Dynamics group at Yahoo! Research led by Duncan Watts. Currently, Sid is one of the founding members of Microsoft Research, New York City. Krysta Svore is a researcher at Microsoft Research in Redmond, Washington, where she manages the Quantum Architectures and Computation group. Svore’s research includes the development and implementation of quantum algorithms, including the design of a scalable, fault-tolerant software architecture for translating a high-level quantum program into a low-level, device-specific quantum implementation, and the study of quantum error correction codes and noise thresholds. She has also developed machine-learning methods for web applications, including ranking, classification, and summarization algorithms. She received her Ph.D. in Computer Science with highest distinction from Columbia University in 2006 and her B.A. from Princeton University in Mathematics and French in 2001. She serves as a representative for the Academic Alliance of the National Center for Women and Information Technology (NCWIT) and is an active member of the American Physical Society (APS) and the Association for Computing Machinery (ACM). Desney Tan is a Principal Researcher at Microsoft Research, where he manages the Computational User Experiences group. He also holds an affiliate faculty appointment in the Department of Computer Science and Engineering at the University of Washington. Desney’s research interests include Human-Computer Interaction, Mobile Computing, and Healthcare. Desney was honored as one of MIT Technology Review’s 2007 Young Innovators Under 35 for his work on Brain-Computer Interfaces. He was named one of SciFi Channel’s Young Visionaries at TED 2009, as well as Forbes’ Revolutionaries: Radical Thinkers and their World-Changing Ideas for his work on Whole Body Computing. More recently, Desney was designated a Kavli Fellow by the US National Academy of Sciences. Among other service roles, he has served as Technical Program Chair for the CHI 2008 Conference on Human Factors in Computing Systems and well as General Chair for CHI 2011. Bhuvan Urgaonkar is an associate professor of computer science and engineering at Penn State, where he has worked since 2005. He earned the Ph.D. (2005) degree in computer science at the University of Massachusetts Amherst and the B.Tech (honors) degree in computer science and engineering at the Indian Institute of Technology Kharagpur (1999). His research involves applying ideas from distributed computing, resource management, performance evaluation, and analytical modeling to the design and evaluation of data centers, networked systems, and operating systems. Urgaonkar is a recipient of the NSF CAREER Award (2010) and a research award from Cisco (2007). With his co-authors, he has received the following awards or other special recognition: “Best Paper” at IEEE IISWC 2013, “Best Paper” at IEEE MASCOTS 2012, “Best Paper Nomination” at ACM Sigmetrics 2012, “Best Student Paper” at IEEE MASCOTS 2008, and “Best Student Paper” at IEEE ICAC 2005. Dr. Van Allen is an Instructor in Medicine at Harvard Medical School and a medical oncologist at Dana-Farber/Partners Cancer Care. His research focuses on computational cancer genomics, the application of new technologies such as massively parallel sequencing to personalized cancer medicine, and resistance to targeted therapeutics. He has created an analytical platform for the clinically oriented analysis and interpretation of massively parallel sequencing data from prospectively acquired patient tumors. He also studies computational approaches to characterizing tumor genetic alterations from clinical samples at the time of initial treatment and once there is evidence of treatment resistance in multiple tumor types. Overall, his research focuses on the field of precision cancer medicine and resistance to targeted therapeutics via expertise and study in translational and clinical bioinformatics. Dr. Van Allen studied Symbolic Systems at Stanford University, received his MD from the David Geffen School of Medicine at UCLA, and completed an internal medicine residency at UCSF before coming to Dana-Farber Cancer Institute for his medical oncology fellowship. Evelyne Viegas is the Director of Semantic Computing at Microsoft Research, based in Redmond, Washington, United States. Semantic computing is about interacting with data in rich, safe, and semantically meaningful ways, to create the path from data to information, knowledge, and intelligence. In her current role, Evelyne is building initiatives that focus on information seen as an enabler of innovation, working in partnership with universities and government agencies worldwide. In particular, she is creating programs related to computational intelligence research to drive open innovation and agile experimentation via cloud-based services, as well as projects to advance the state of the art in machine learning, knowledge representation, and reasoning under uncertainty at web scale. Dave Wecker came to Microsoft in 1995 and helped create the “Blender” (digital video post-production facility). He designed and started implementing a Broadband MSN offering when he was asked to join the new CE group where he was architect for the Handheld PC v1 & v2 as well as AutoPC v1 and Pocket PC v1 (he was also development manager). He moved to Intelligent Interface Technology and resurrected SHRDLU for Natural Language research as well as building a state of the art Neural Network based Speech Recognition system. He was then asked to come back to CE to manage Synch and Wireless efforts. He worked on next gen technologies for the Mobile Devices Division before moving to e-books where he implemented secure DRM on Pocket PCs (the “black-box”). He created and was director of ePeriodicals before taking on the role of Architect for Emerging Technologies. In this role he had many responsibilities including getting the GM/MSFT relationship off the ground. He worked for the Mobile Platforms Division as an architect and then transferred to Machine Learning Incubation. As architect of the Parallel Computing Technology Strategy team he solved several big data problems and now is focusing on quantum computing. . He has over 20 patents for Microsoft and 9 Ship-It awards. He started coding professionally in 1973, worked in the AI labs at CMU while obtaining a BSEE and MSIA and was at DEC for 13 years. Adam Wierman is a Professor in the Department of Computing and Mathematical Sciences at the California Institute of Technology, where he is a founding member of the Rigorous Systems Research Group (RSRG) and maintains a popular blog called Rigor + Relevance. His research interests center around resource allocation and scheduling decisions in computer systems and services. He received the 2011 ACM SIGMETRICS Rising Star award, and has been coauthor on papers that received of best paper awards at ACM SIGMETRICS, IEEE INFOCOM, IFIP Performance, IEEE Green Computing Conference, IEEE Power & Energy Society General Meeting, and ACM GREENMETRICS. Jeannette M. Wing is Corporate Vice President, Microsoft Research. She is in charge of the seven Microsoft Research research labs worldwide. She joined Microsoft last year from Carnegie Mellon University, where she was President’s Professor of Computer Science and twice served as the Head of the Computer Science Department. From 2007 to 2010, she was the Assistant Director of the Computer and Information Science and Engineering Directorate at the National Science Foundation. She received her S.B., S.M., and Ph.D. degrees in computer science, all from the Massachusetts Institute of Technology. Dr. Wing has published extensively in the areas of trustworthy computing (including security and privacy), specification and verification, concurrent and distributed systems, programming languages, and software engineering. She has been on many government, academic, and industrial advisory boards, and is incoming chair of DARPA ISAT. She is on the editorial boards of seven journals, including Communications of the ACM and Journal of the ACM. She received the CRA Distinguished Service Award in 2011. She is a Fellow of the American Academy of Arts and Sciences, American Association for the Advancement of Science, the Association for Computing Machinery (ACM), and the Institute of Electrical and Electronic Engineers (IEEE). Dr. Eric Xing is an associate professor in the School of Computer Science at Carnegie Mellon University. His principal research interests lie in the development of machine learning and statistical methodology; especially for solving problems involving automated learning, reasoning, and decision-making in high-dimensional and dynamic possible worlds; and for building quantitative models and predictive understandings of biological systems. Professor Xing received a Ph.D. in Molecular Biology from Rutgers University, and another Ph.D. in Computer Science from UC Berkeley. His current work involves, 1) foundations of statistical learning, including theory and algorithms for estimating time/space varying-coefficient models, sparse structured input/output models, and nonparametric Bayesian models; 2) computational and statistical analysis of gene regulation, genetic variation, and disease associations; and 3) application of statistical learning in social networks, data mining, and vision. Yan Xu has been a teacher in the school of Biological and Medical Engineering of Beihang University since July 2009. Also, Dr. Xu has worked at Microsoft Research Asia as a visiting researcher since March 2009. Dr. Xu received her PhD degree in the Department of Biomedical Engineering of Tsinghua University, Beijing, China, in 2009. From August 2007 to August 2008, as an exchange student supported by the Chinese government, she studied in the Computer and Electronic department of Iowa University. Her research areas include weakly supervised learning, deep learning, medical image analysis, medical language processing, and parallel algorithms for “big data.” She has published, as the first author or the corresponding author, more than 20 conference and journal papers. Dr. Dong Yu joined Microsoft Corporation in 1998 and the Microsoft Speech and Dialog Research Group in 2002, where he currently is a principal researcher. His current research interests include speech processing, robust speech recognition, discriminative training, and machine learning. He has published over 130 papers in these areas and is the coinventor of more than 50 granted/pending patents. The context-dependent deep neural network hidden Markov model (CD-DNN-HMM) he co-proposed and developed has been seriously challenging the dominant position of the conventional GMM based system for large vocabulary speech recognition. His this work was recognized by the IEEE SPS 2013 best paper award. Haoqi Zhang is an assistant professor at Northwestern University in EECS and the Segal Design Institute. His research spans the fields of social computing, crowdsourcing, human computer interaction, artificial intelligence, and decision science. His current work focuses on engaging crowds and communities in problem solving efforts, and on advancing new data-driven design processes. He received his Ph.D. in Computer Science and B.A. in Computer Science and Economics from Harvard University. Chunmiao Zheng currently holds the position of Chair Professor and Director of the Center for Water Research at Peking University. He has also been the George Lindahl III Endowed Professor at the University of Alabama. The primary areas of his academic research are hydrologic modeling, water management, and eco-hydrological processes. Zheng is developer of the MT3DMS contaminant transport model, and author or co-author of more than 150 papers and 5 books. Zheng has served as associate editor for leading water resources journals. Currently, Zheng is a member of the Standing Committee on Hydrologic Science of the U.S. National Research Council. For his outstanding contributions to the fields of hydrogeology and groundwater science, he was awarded the O.E. Meinzer award by the Geological Society of America and the M. King Hubbert award by the National Ground Water Association, both in 2013. Zheng received a Ph.D. in hydrogeology from the University of Wisconsin-Madison. Geoffrey Zweig is a Principal Researcher, and Manager of the Speech & Dialog Group at Microsoft Research. His research interests lie in improved algorithms for acoustic and language modeling for speech recognition, and language processing for downstream applications. Recent work has included the development of methods for conditioning recurrent neural networks on side-information for applications such as machine translation, and the use of recurrent neural network language models in first pass speech recognition. Prior to Microsoft, Dr. Zweig managed the Advanced Large Vocabulary Continuous Speech Recognition Group at IBM Research, with a focus on the DARPA EARS and GALE programs. Dr. Zweig received his PhD from the University of California at Berkeley. He is the author of over 80 papers, numerous patents, an Associate Editor of Computers Speech & Language, and is a Fellow of the IEEE. Join us for a conversation to reflect on the ethics, implications, and responsibilities of social media research, in the wake of the Facebook emotion study. What obligations must researchers consider when studying human interaction online? When does data science become human subjects research? What can we learn as a collective from the public’s reaction to Facebook’s recent research as well as reflection on our own work? Mary L. Gray (Microsoft Research) and Jeff Hancock (Cornell University and co-author of the Facebook emotion study), will facilitate a panel discussion among researchers based at Microsoft Research and across academia from the fields of data science, computational social science, qualitative social science, and computer science. Over the years, we have been successful making computing devices smaller, more efficient, and cheaper. Unfortunately, barriers such as constraints on power and energy mean we can no longer trivially shrink today’s devices any further. In this session, we will explore creative approaches to new challenges in user interaction, low-power system designs, novel form factors, and hardware innovations. From Airbnb, to Kickstarter, to Mechanical Turk, the on-demand provisioning of workforce, services, and goods is changing the nature of work and play. In this session, we focus on exploring the challenges and opportunities with these platforms that span from the technological to the social. We will also discuss the future of crowd-based work. The session will feature a wide range of speakers involved in crowdsourcing research as well as lively discussion panels. Deep learning has enjoyed tremendous success in recent years in speech and visual object recognition, as well as in language processing (although to somewhat less extent). The focus of this session is on deep learning approaches to problems in language or text processing, with particular emphasis on important applications with vital significance to Microsoft. First, we will have both academic and Microsoft Research experts provide a tutorial on the latest deep learning technology, presenting both theoretical and practical perspectives on common methods of deep neural networks and recurrent, recursive, stacking, and convolutional networks. We will highlight special challenges faced by language/text processing, and elaborate on how new deep learning technologies are poised to fundamentally address these issues. We will share Microsoft Research’s experience in developing Deep-Structured Semantic Models (DSSM) and their successful applications to web search, ads selection, machine translation, and entity search. Join us on a journey. Big Dream, a series and film produced by Microsoft Research and Iron Way Films, centers around the stories of five young women around the globe working on transforming the world through technology. Each story will show an intimate look at these young women’s ambitions, challenges, and innovative approaches to their lives. You will also hear voices of women— both accomplished and starting their computer science career—who share their fears, aspirations, advice, and their big audacious dreams. The Big Dream Campaign will launch in the fall of 2014. You will get an early glimpse into three of the five stories. You will meet the producer, researchers, and students in the film and have the opportunity to ask them questions. You will learn what role your university and you can take to join the Big Dream Movement. Join us to be inspired and see how we can grow more women in computing. An increasing number of research areas rely on collecting data from sensors and devices deployed in homes and beyond. Researchers typically deploy such devices, collect data, analyze and make interesting inferences based on this data. In order to collecting sufficient data to have confidence in the research findings it is desirable to collect data from a large numbers of locations. However, doing so requires major investment in engineering expertise and technology infrastructure; both not readily available to the academic community. Microsoft Research’s Lab of Things aims to provide such an infrastructure to facilitate at-scale in-situ research in a number of research areas. In this session, academic researchers deploying studies using the Lab of Things will provide overview of their in-situ research and lessons learnt while deploying such studies. This session will look into the latest advances in areas of machine learning, such as causality, while also reviewing our understanding of topics such as deep learning, and how to scale machine learning. This session will also highlight steps towards doing reproducible science by enabling researchers to share code and data, and experiments to help nurture an environment of scientific rigor. And it will open up new avenues for collaboration between researchers via the use of co-opetitions where people can cooperate with each other to reach a higher value than by merely competing. A hardware revolution has slashed the cost of sequencing by over a million-fold in a few years, far faster than Moore’s law, opening great opportunities for software to revolutionize healthcare. This session will explore how the combination of the $1,000 genome with molecular diagnostics and electronic medical records, across millions of patients, will transform medicine, making it not just personalized, but also predictive, preventive, and participatory. You will hear about a pioneering program to follow 100,000 well patients, building for each individual a multi-dimensional data model to optimize their wellness and minimize their disease. We will also discuss how genomic data is being used in the clinic to personalize cancer therapies to individual patients; the computational analysis of HIV evolution, transmission, and immune response, to improve the effectiveness of therapeutics and vaccines; and how to efficiently scale genomic analysis into the cloud. Architects draw detailed blueprints before a brick is laid or a nail is hammered. Programmers and software engineers seldom do. A blueprint for software is called a specification. The need for extremely rigorous specifications before coding complex or critical systems should be obvious—especially for concurrent and distributed systems. This talk explains why some sort of specification should be written for any software. Social media, we have been promised, supports the well-being of individuals and society. It has been said that it offers new opportunities for democratic participation, that it supports collective action and gives individuals a voice. Social capital, once lost through the dormancy of ties, hidden as a result of infrequent contact, has been made visible through the persistent and pervasive nature of social media. Yet, it is often said that these technologies do not live up to their hype, that they contribute to social isolation, stress, and disengagement. This presentation argues that community on and offline is being reorganized as a result of digital technologies that afford and constrain engagement. Evidence from a series of empirical studies explains how digital technologies are related to social capital, deliberation, caring, and the joy that we sometimes get from the awareness that we are all missing out. Availability of high quality education is widely acknowledged to be the pathway to success in modern society. The past few years have seen a tremendous interest in use of MOOCs, SPOCs, flipped-classrooms / blended-learning to provide more scalable and affordable models for student learning. However, it is still hard to author interactive online lessons, so only a small fraction of faculty create or use them. This session will introduce Office Mix, a brand new offering from Microsoft that dramatically simplifies the creation of such online lessons, including their publishing and sharing, and associated analytics. Office Mix builds upon the deep familiarity of faculty and students with PowerPoint to create such lessons, and use the slide decks they already have in their arsenal. We will also discuss use cases beyond online learning, to sharing and communication of academic research. The session will also cover two other efforts from Microsoft Research. Sumit Basu will show Powergrading, a powerful method for increasing the efficiency of grading students answers to online short-answer questions. Rakesh Agarwal will discuss technologies for inferring a knowledge graph from current education material, enriching the graph with rich content in multiple format mined from the web as well as crowd-sourcing, and then overlaying it with the social graph of teachers and students to enable dynamic formation of study teams with the goal of maximizing overall learning. The last few years have witnessed a renaissance in multiple areas of speech and language processing. In speech recognition, deep neural networks have led to significant performance improvements; in language processing the idea of continuous-space representations of words and language has become mainstream; and dialog systems have advanced to the point where automated personal assistants are now everyday fare on mobile devices. In this session, we bring together researchers from the different disciplines of speech and language processing to discuss the key ideas that have made this possible, and the remaining challenges and next generation of applications. Online apps that matter are geo-distributed, because they serve millions of users around the world. Geo-distribution is important for latency, availability, and increasingly also for efficiency. Due to rapid growth in the volume of demand served, large numbers of geo-distributed data centers today can benefit from the same multi-megawatt economies of scale that were initially limited to a few centralized ones. As a result, modern cloud infrastructures are already highly geo-distributed. Trends such as our increasing reliance on online services, and the growth in mobile device usage that has converted many client based applications into cloud services, indicate that data center infrastructures will be even more geo-distributed in the future. This session discusses challenges in designing a geo-distributed data center infrastructure and developing software applications for it. In a world with a billion sensors, how will we make sense of it all? In our daily lives we encounter sensors all the time, like when a motion sensor turns a light on in a dark place, or when a carbon monoxide detector tell us that the air is becoming hazardous. Sensors extend our abilities to see, hear, and feel far beyond what we ourselves can take in—from arrays of telescopes sensing the edges of the universe to nano-scale biological sensors amplifying our own sense of smell. How will sensors change the way we perceive not only our environment but ourselves and others? How will sensors change the way we live and work? What interfaces, services, devices and experiences will be necessary to make sense of it all and avoid sensory overload? What are key problems this data can be used to help solve, what new troubles can we anticipate it creates? Project: Navi-Band: A tool toy for safety, navigation and play. This presentation draws together experts in the field to discuss the technical and social challenges posed by crowdsourcing’s global workflows. While crowdwork is often presumed to be driven by anonymous, autonomous actors, this panel draws on a diverse set of research approaches to flesh out a more socially robust vision of this vital part of the information economy. We examine crowdsourcing’s systems of exchange and collaboration as well as the range of networks and incentives that organize crowdwork. Each panelist offers a perspective from current findings, from computational and qualitative approaches, to ask: who are crowdworkers and how might seeing who they are help us build more responsive, expansive, and ethical platforms? The sciences are currently undergoing a fundamental transition due to the avalanche of data that is generated by instruments, simulations, on-line archives and social media. The impact of the data revolution is seen in every discipline. Cloud computing was invented to manage the big data challenges of Internet companies, but it is now seen as a critical tools for many research communities. Life Science, environmental science and geosciences have been early adopters of cloud technology because of easy by which the cloud can accrue data from many sources and make it available for analysis by large communities. This session illustrates work by academic researchers who have been awarded “Microsoft Azure for Research” cloud awards. We highlight four of our early project out of the 190 projects that we have awarded. We will also briefly discuss some new tools for machine learning and data analysis in the cloud that we will be making available to the community. Parallelism abounds in modern hardware—from the datacenter to multi-cores, GPUs, and FPGAs. On the other hand, important algorithms, such as graph algorithms, dynamic programming, and finite-state machine processing involve fine-grained dependencies and do not directly map on to this parallel hardware. Harnessing the parallelism available for these algorithms requires new algorithms, new programming languages, and new runtime systems. This session will present recent advances in this area and will serve as forum for bringing together researchers from diverse disciplines—such as algorithms, programming languages, compilers and runtime, machine-learning, architecture, and systems—into this exciting research area. Three decades have passed since Richard Feynman first proposed devising a “quantum computer” founded on the laws of quantum physics to achieve computational speed-ups over classical methods. In that time, quantum algorithms have been developed that offer fast solutions to problems in a variety of fields including number theory, chemistry, and materials science. To execute such algorithms on a quantum device will require extensive quantum and classical “software”. One of the grand challenges for the computer science community is the design and implementation of a software architecture to control and program quantum hardware. This session will address how to build a scalable, reliable quantum computer: What are the quantum and classical resource requirements? How do we protect the device against errors? How do we program the quantum computer? It will highlight recent advances in quantum device architectures, error correction, and software design tools, and pose crucial open questions in quantum computer science. Confused and frustrated by your difficult programming task? Let’s have your IDE intervene before you get the chance to cause a bug in the software. Bored by your rote assignment? Let’s have your browser find a funny YouTube video to snap you out of it. Stressed out? Let’s Snapchat your friends so they can call and lend you an ear. What else could a computer do if it knew what you were feeling? In this session, we’ll talk about several research projects which leverage low-cost biometric sensors to sense your affect and take action to help you out. Each year, we hold events the day after the Faculty Summit to provide opportunities for deeper technical engagement. The following seven events took place at the Microsoft Conference Center on Wednesday, July 16, 2014, starting at 9:00 A.M. Approaching the End of Moore’s Law: Time to Reinvent the System Stack? The rapid, continuous, and economically viable evolution of semiconductor technology scaling has, in multiple cases, outpaced the system stack’s ability to evolve adequately. However, growing economic difficulties in extending scaling may make it difficult to sustain further efficiency gains via semiconductor technology. The recent movements toward multicore, specialization, and optimized storage stacks follow from this phenomenon. The demands of applications and their data on storage and processing capabilities are not expected to stop growing, putting even more pressure on system efficiency. This full-day workshop will provide insights on the efficiency issue through examples, and then promote discussion of opportunities in this area through a mix of driving application scenarios and synergistic opportunities across the system stack. Today’s data-driven research and development is stymied by an inability for scientists and their collaborators to easily reproduce and augment one another’s experiments. CodaLab addresses this problem by providing a cloud-based virtual “workbench” where computer scientists can conduct data-driven experiments quickly and easily. These experiments can then be easily copied, re-worked, and edited by other collaborators in order to advance the state of the art in data-driven research and machine learning. CodaLab allows communities to create competitions to focus on some tasks, which results can then be provided back to the community as experiments for further development. By improving productivity by multiple orders of magnitude, CodaLab makes it easy for scientists and their collaborators to focus on the challenges at hand and not get delayed by the difficult and laborious work of setting up a new experiment. The iSchools Organization is a growing worldwide association of Information Schools dedicated to advancing education in social media, digital youth, data science, cybersecurity, information policy, and other aspects of the field of information science, and preparing students to meet the information challenges of the twenty-first century. This half-day Faculty Summit ancillary event is intended to bring together Microsoft Research and the iSchool heads to continue the dialog between our organizations and to foster collaboration opportunities. The goal of the Lab of Things (LoT) Workshop 2014 is to enable the LoT community to exchange ideas and form collaborations. It will be a day for current and future LoT researchers to share experiences and discuss future directions. The Lab of Things team will present an introduction to LoT along with current status and an update about our future plans. The annual Software Engineering Innovation Foundation (SEIF) Day brings together SEIF winners, influential software engineering researchers, and researchers from Microsoft Research to present and discuss existing software engineering projects being pursued by the SEIF community, and future directions in software engineering research. Latest semiconductor, sensing, communication, energy harvesting, and energy storage technology advances keep pushing the boundaries of low power devices and computing paradigms. They are giving rise to sensing and computing systems with extremely low power consumption, and bring challenges in terms of designing, programing, and interacting with such systems. This workshop provide a forum for top researchers in the field to present their latest research results and discuss future potentials, from enabling technologies, hardware and software platforms, to applications. With this event, we hope to foster cross-disciplinary collaborations and to boost the awareness and impact of ultra-low power computing. In 1981, Richard Feynman proposed a device called a “quantum computer” that would take advantage of methods founded on the laws of quantum physics and promise computational speed-ups over classical methods. In the last three decades, quantum algorithms have been developed that offer fast solutions to problems in a variety of fields including number theory, optimization, database search, chemistry, and physics. For quantum devices, this past year marks significant progress towards scalable quantum bits and gates. The workshop will highlight recent advances in quantum algorithms, quantum devices, control systems, and quantum error correction. Other quantum topics may be covered depending on the speakers’ preferences. On this page you will find the in-person event sessions, online broadcasted keynote presentations and the Research in Focus interview segments. An increasing number of research areas rely on collecting data from sensors and devices deployed in homes and beyond. Researchers typically deploy such devices, collect data, analyze and make interesting inferences based on this data. In order to collect sufficient data and have confidence in the research findings, it is desirable to collect data from a large numbers of locations. However, doing so requires major investment in engineering expertise and technology infrastructure—neither of which is readily available to the academic community. Microsoft Research’s Lab of Things aims to provide such an infrastructure to facilitate at-scale in-situ research in a number of research areas. In this demo, the Lab of Things team and academic collaborators demonstrated the research platform, along with some of the current deployments. Understanding ecological and hydrologic processes and their interactions in large watersheds is of critical importance to society in need of sustainable fresh water supplies. This project is to support the comprehensive data processing and numerical modeling in the Heike River Basin using Microsoft Azure, the cloud platform, and to further develop the cloud computing as a cost-effective solution to large-scale integrated eco-hydrologic modeling. Genes usually contribute to the development of diseases through biological events such as gene expression, regulation, phosphorylation, localization, and protein catabolism. Our disease-gene search engine, DigSee, services the sentences from MEDLINE abstracts with identified triple relations that ‘which genes’ are involved in the development of ‘which cancer’ through ‘which biological events’. Since the current version of DigSee supports only cancer, our goal is to incorporate more diseases types other than cancers into the system. This new system will allow researchers working on various types of diseases to search which genes are related to the disease through which biological events. NFC-Ring is an always-available user input device in the form of a form-factor wearable ring. It has built-in low-power gesture recognition capabilities that interprets various gestures performed on arbitrary surfaces and transmit those gestures wirelessly. The NFC-Ring recharges its limited capacity internal battery by on-demand NFC energy scavenging. It uses a low-power NFC tag emulator to scavenge energy when the user holds a screen-unlocked mobile phone in her hand. CodaLab helps solve these problems by creating an online community where people share worksheets or participate in competitions. CodaLab Worksheets lower the barrier to documenting and publishing detailed experiments, streamlining the research and learning process. CodaLab nurtures an environment of scientific rigor by enabling reproducibility and transparency, and it opens new avenues for collaboration between researchers, developers, and data scientists. Naiad is a .NET-based platform for high-throughput, low-latency data analysis. These properties have made it suitable not just for traditional “big data” processing, but also for stream processing on real-time data, complex graph analyses, and machine-learning tasks. Moreover, Naiad is built with extensibility in mind, providing analysts with simple interfaces, but enabling them to integrate custom business logic when required. Using Naiad on Azure enables an analyst to develop an application locally before deploying it seamlessly to the cloud. Several tools have been built atop Naiad, to use Azure to provide interactive analyses over massive data sets. Tempe is a living research notebook for analyzing large datasets, from either offline or online data sources. The goal of Tempe is to provide an interactive, informative user experience for a data scientist’s entire workflow, including cleaning up and transforming raw data, defining new data features, training classifiers, and producing visualizations. Tempe uses the Trill data processing engine to provide progressive query results for offline data and temporal data results for online data. The project generates personalized HRTFs by scanning a person using a Kinect for Windows device, then using a headset to identify a predefined area. It enables the user to interact with a virtual set of physical objects-such as an AM radio, a manikin, a phone, or a television-that start to play music, speak, and ring. The user can move freely, rotate her head, and approach each individual sound source within a virtual experience. Building the world’s most advanced digital assistant using state-of-the-art machine learning and keeping a deep focus on the user experience. Microsoft Azure Machine Learning is a service on Windows Azure, which a developer/data scientist/BI analyst can use to easily build a predictive model using machine learning over data, and then deploy and manage that model as a cloud service. ML Studio offers functionality to support the end-to-end workflow for constructing a predictive model; from ready access to common data sources in the cloud, data exploration, feature selection and creation, building training and testing sets, machine learning over data and experimentation, to final model evaluation and deployment. Code Hunt: What if Coding Were a Game? Code Hunt is a browser-based game for anyone who is interested in coding. We built Code Hunt to take advantage of the fact that any task can be more effective and sustainable when it’s fun. Coding competitions usually give specifications for problems and then check solutions automatically using a test suite. Code Hunt is different. Instead of presenting a problem, Code Hunt presents an empty slate to the player and a set of constantly changing test cases. It thus teaches coding as a by-product of solving a problem that is presented as pattern matching inputs and outputs. The fun is in finding the pattern. We have run very large competitions with thousands of students and found that Code Hunt differentiates the top students from the others. We’ll demonstrate the game, and give statistics, as well as offer opportunities for research. This demo draws on ethnographic and quantitative data to produce a richly contextualized data visualization of crowdsourcing’s global workflows. We analyze data from several sources: survey responses from crowdworkers across three popular crowdsourcing platforms; ethnographic interviews and participant observation among crowdworkers; U.S. and India census data; and backend data from Microsoft’s Universal Human Relevance System (UHRS) and MobileWorks, a Bay-area start-up. We present visual, interactive map overlays generated from the data sets to illustrate how crowdworker demographics, such as income, education and employment, compare with those of the general population. We also present analyses of platform data, gauging workflows, ranging from time-on-task to systems quality control. Combining computational and qualitative approaches we ask: who are crowdworkers and how might seeing who they are help us build more responsive, expansive and ethical platforms? Availability of high quality education is widely acknowledged as the pathway to success in modern society. The past few years have seen a tremendous interest in use of MOOCs, SPOCs, flipped-classrooms / blended-learning to provide more scalable and affordable models for student learning. However, it is still hard to author interactive online lessons, so only a small fraction of faculty create or use them. This session will introduce Office Mix, a brand new offering from Microsoft that dramatically simplifies the creation of such online lessons, including their publishing and sharing, and associated analytics. Office Mix builds upon the deep familiarity of faculty and students with PowerPoint to create such lessons, and use the slide decks they already have in their arsenal. We will also discuss use cases beyond online learning, to sharing and communication of academic research. The session will also cover two other efforts from Microsoft Research. Sumit Basu will show Powergrading, a powerful method for increasing the efficiency of grading students’ answers to online short-answer questions. Rakesh Agarwal will discuss technologies for inferring a knowledge graph from current education material, enriching the graph with rich content in multiple format mined from the Web as well as crowd-sourcing, and then overlaying it with the social graph of teachers and students to enable dynamic formation of study teams with the goal of maximizing overall learning. HereHere uses Project Sentient Data, an early-stage project to explore how interactions can be improved by understanding ecosystems of data in terms of characterization, personalities, and relationships. Sentient Data provides a server and a representational-state-transfer API that enables developers to assign personalities and translate data sets into their relative emotion states. We are experiencing a technology shift: Powerful and easy-to-use mobile devices like smartphones and tablets are becoming more prevalent than traditional PCs and laptops. Mobile devices are going to be the first and possibly the only computing devices that virtually all people will own and carry with them at all times. In this session, we will show how anyone can develop software directly on their mobile devices. We have created TouchDevelop, a modern software development environment that embraces the new reality of cloud-connected mobile devices. TouchDevelop comes with typed, structured programming language that is built around the idea of using a touchscreen as the input device to author code. Access to the cloud, flexible user interfaces, and access to sensors such as accelerometer and GPS are easily available. In our experience, TouchDevelop is well suited for education, as mobile devices engage students, and the programming environment focuses on core programming tasks supported by interactive tutorials. TouchDevelop is available as a web app on Windows tablets, iOS, Android, Windows PCs and Macs, and as a native app on Windows Phone. In our daily lives we encounter sensors all the time, like when a motion sensor turns a light on in a dark place, or when a carbon monoxide detector tell us that the air is becoming hazardous. Sensors extend our abilities to see, hear, and feel far beyond what we ourselves can take in—from arrays of telescopes sensing the edges of the universe to nano-scale biological sensors amplifying our own sense of smell.